An annual free festival of music will take place with Music in the Market in Buckingham later this month. This is the 17th year the popular event has showcased local musicians for a day of acoustic based music which will start this year with Rock Formation at 1pm and end with headline act, The Straight Laces, playing from 8.45pm until the event finishes at 10pm on Sunday, May 28. Other artists on the day will include finger style guitar wizardry from Udo Dolz; the hugely popular choir The Buckingham Glee Club with a range of up-to-date songs; folk singer Mike Weston; Chris Baston on keyboards and vocals with songs from Bowie to Elton John; and Henry Sampson with a voice that is a mixture of Elvis and Jim Reeves. Elaine, Becks and Sara from headline act The Straight Laces got together from other musical ventures two years ago to form a great band that regularly plays to packed gigs around the town. 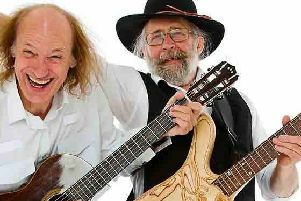 Organised by the Buckingham Acoustic Club in partnership with the town council, Music in the Market includes professional staging and sound and gives everyone the chance to Zumba. Food, drinks and snacks will be available from Pegasus Catering, The King’s Head, Binn Smokehouse and many other town centre businesses. Previous events have seen up to 1,000 people gather in the Market Square to listen, chill out and dance in the sun. Everyone is welcome to take a camping chair and picnic along. Although the event is free to attend, every year a collection is organised for the mayor’s charities and this year Buckingham’s new mayor Jon Harvey has nominated UNICEF, NSPCC and Buckingham Youth Centre as the charities he would like to support. Collection buckets will be available throughout the day. Many of this year’s performers started out playing at the Buckingham Acoustic Club’s open mic which takes place from 8.30pm every Thursday at The Woolpack in Well Street. A sound system is provided and everyone is welcome to get up and have a go, with styles from Bowie to classical guitar, from folk to AC/DC and Nirvana.